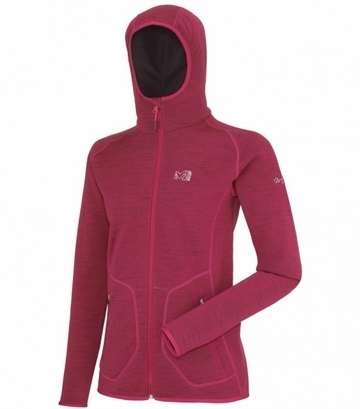 "Streamlined for light weight and energy efficiency, this feminine jacket, with its active Alpine fit, is designed for women and built to provide warm comfort. A fixed hood enhance protection against the elements, while the soft, warm and breathable wool delivers natural temperature regulation and moisture wicking properties. It will keep you comfortable, even in the damp, when the weather settles down: When wet, the wool fiber inflates, which retains air and thus, enhance its insulation capacity. When the wool dries, it deflates, retaining warmth, allowing more air to pass unhindered. A natural temperature regulator, Merino wool is also naturally antibacterial.